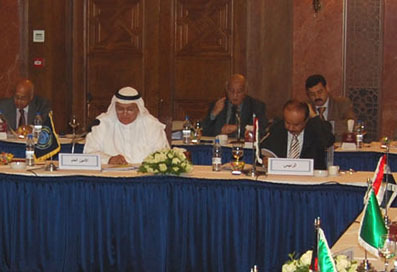 The OAPEC is a multi-governmental organization headquartered in Kuwait which coordinates energy policies in Arab nations. In 1968 three of Arab oil states Kuwait, Libya and Saudi Arabia agreed in Beirut to found OAPEC, aiming to separate oil production and sale from politics in the wake of the halfhearted 1967 oil embargo related to the Six Day War. OAPEC is currently regarded as a regional specialized international organization and focuses on organizing cooperation on oil development, collective projects and regional integration. The organization has ten member states. Its flag is dark blue with its logo in the center of the flag.